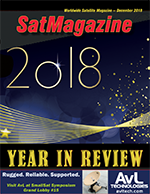 The defining characteristic of ManSat’s satellite spectrum business in 2018 is growth fueled by agility and customer focus. With almost 20 years of experience, ManSat has a hard-earned reputation of bringing transparency, ease of use, and expertise to the ITU filing process for established global operators and start-ups alike. “No spectrum, no satellite. 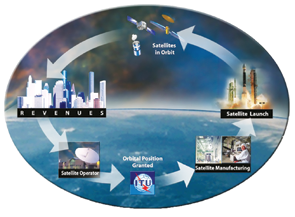 Know spectrum, know satellite.” The correct filing is a critical step toward bringing a new satellite or constellation into use. ManSat presently leads the third largest filing jurisdiction in the world for commercial Geostationary satellites, according to independent studies conducted by Northern Sky Research, and is itself the world’s largest commercial provider of satellite spectrum. ManSat has carefully preserved its start-up culture and willingness to flexibly respond to customer needs. This principal continued to bear fruit in 2018 with further growth. Tremendous technological advancements are bringing the same performance to smaller and lighter platforms, enabling significant growth in the small satellite market. Northern Sky Research’s Small Satellite Markets Report confirmed 211 smallsats already launched, and/or forecasted to launch, by the close of 2018 in their comprehensive survey of the industry. With launch rates reaching historic levels and expected to continue rising, it’s clear why ManSat and many others in the industry spent 2018 implementing changes in response to this market growth. As a result, ManSat was able to welcome its first Non Geostationary constellations and Remote Sensing customers. True to its customer-focused roots and with an eye to change, ManSat expanded its service offering with the goal of providing dynamic services tailored to each customer’s varied needs. The result was growth in ManSat’s consulting business that exceeded expectations and yielded significant reinvestment and expansion. New customers from Geostationary Communications to Non Geostationary Remote Sensing selected ManSat for ITU filing and an array of other services. ManSat expanded its U.S. footprint with the establishment of West Coast offices in San Diego, California, with Katherine Gizinski joining ManSat as a Vice President of Sales and Marketing to focus on end-to-end service solutions. John Sheath also joined the ManSat leadership team as Chief Financial Officer and Finance Director, bringing a breadth of knowledge and experience to the team from a career in banking and insurance. 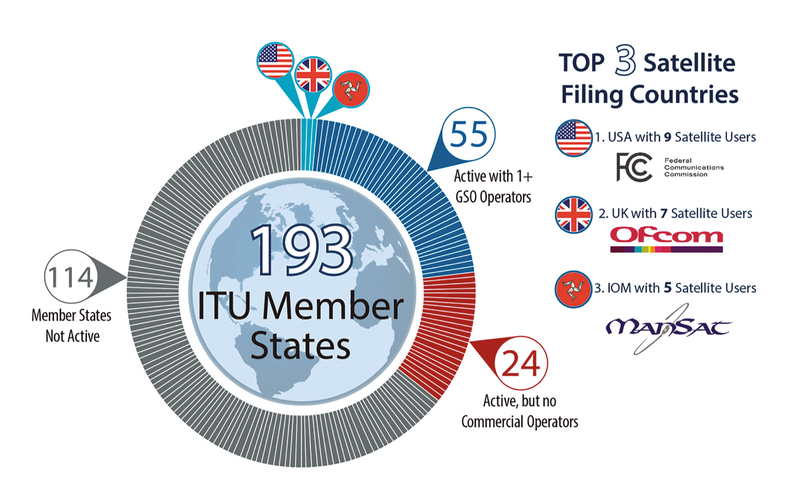 In 2019, the trend of growth will continue, with a new office slated to open in support of additional ITU filing service offerings. Chris Stott is the Chairman and Chief Executive Officer of ManSat, the company he co-founded with his father, Bryan. In 2000, he left his position as Director of International Commercialization and Sales with Lockheed Martin Space Operations to become ManSat’s President. Prior to his work with Lockheed Martin, Chris was an executive with McDonnell Douglas and the Boeing Company working in International Business Development on the Delta Launch Vehicle program. Katherine Gizinski is the Vice President of Sales and Marketing for ManSat. Before joining ManSat, Katherine worked with U.S. defense contractors to bring cutting edge commercial satellite and terrestrial communication technologies to austere environments in support of military, diplomatic, first responder, and commercial initiatives. As the largest maritime communications provider in the market, Marlink is in a position of responsibility. The company’s diverse customer base wants access to efficiency enhancing applications and Marlink’s job is to deliver the communications infrastructure that enable them. Marlink’s response is to continue growing its highly resilient global network and, this year, such has strategically added new beams to cover the busiest areas and also regions where more demand is emerging, due to changing usage of the oceans. Reflecting the former, the Marlink network serving Singapore had new, over-lapping beams added to meet demand in one of the world’s busiest shipping regions. For the latter, the network expanded for various specific user-groups. First of all, new satellite capacity was added in the Indian Ocean and around the Falkland Island,s with specific focus on delivering reliable, high bandwidth VSAT services to commercial fishing vessels. The new capacity is already enabling improved vessel and fleet operations and providing greater access to voice calling and internet for crews on a number of Spanish tuna vessels in the Indian Ocean that are serviced by Marlink partner Nautical, while the extra bandwidth around the Falkland Islands has been put in place to meet a predicted spike in demand as more companies look for new fishing grounds. Also in response to changing market demands and usage patterns, new capacity was added in the North West passage to meet the high-end needs of Marlink’s growing adventure cruising customer-base. The new satellites and beams provide flexible access to reliable, high-speed Internet connectivity, enabling operational, crew and guest communications in the fast-growing adventure cruising and bandwidth-hungry superyacht markets. The coverage spans the east coast of Canada to the western tip of Alaska, helping to open the region further for cruise ships and superyachts looking for adventure off the beaten track. With sea ice receding, larger vessels are now able to further explore the Northwest Passage, which is generating significant extra demand for connectivity. Selecting a provider with more sources of high throughput services enabled by redundant and overlapping satellite coverage ensures quality of service, resulting in more uptime even in the most remote regions. The Northwest Passage capacity was joined by a further boost for the Mediterranean and Caribbean, delivering even more potential for digital transformation in the adventure cruise and superyacht sectors. French luxury cruise specialist Ponant uses Marlink’s multi-band communication services to meet the increasing demand for fast, reliable and available connectivity driven by its unique and global expedition and luxury cruise offering. With its seven strong fleet (and two new builds on the way), Ponant offers exceptional itineraries and five-star hotel services, specializing in French-style cruises designed to offer excellence across the board, from ship-board services to the quality and exclusivity of the itinerary destinations. These luxury vessels all promise high-end experiences, of which available communication even in tropical regions, the Arctic and Antarctic is a vital ingredient. Marlink’s satellite services for all Ponant vessels include class-leading internet access, premium quality telephone, GSM and data communications connectivity for on board guests, crew and business based on global coverage, including this year’s extensions. Marlink is able to deliver even higher QoS to Ponant through its unique global network of overlapping beams on all frequencies. 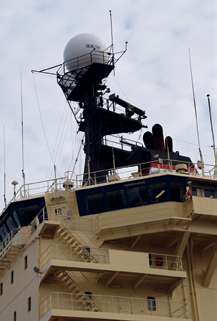 Each vessel has access to global Ku- and C-band VSAT in addition to L-band solutions and GSM/LTE services, ensuring that the best available service is in use at any time and that IP and voice communication is always available. Marlink’s sophisticated SMARTConnect service handles switching between alternate carriers to ensure seamless connectivity and class-leading uptime. While the firm’s global network continues to grow, Marlink also stays committed to offering new technologies — in August, two new solutions for the XChange centralized communications management system were launched. XChange Cloud helps ship owners and operators to streamline and automate their business, logistical and vessel operations by providing a secured, reliable and easy to manage platform to share files of any size or type across a fleet of vessels of any size. It has been designed to specifically support the business needs of maritime users who wish to effectively implement a more digital approach, including automation, to their fleet operations management. XChange FX, also launched this August, is an advanced new hardware solution designed to maximize value for Marlink customers using Inmarsat Fleet Xpress voice and data services. XChange FX provides previously unavailable network and service information in real-time, enabling users to manage usage according to status and ensuring Marlink’s global support network can react fast and effectively to any issues, based on the availability of precise, real-time network data. The system also future-proofs Fleet Xpress, by enabling over-the-air firmware and software updates. While Marlink Fleet Xpress users already enjoy exclusive access to the most extensive portfolio of business critical solutions, XChange FX adds an extra layer of management functionality which empowers end-users to make the most effective use of Fleet Xpress. It provides unique visibility into on board network performance and statistics, ensuring users will always know if they are using Ka-band or L-band via a number of methods including a built in LCD screen, enabling usage patterns to be adjusted. More in-depth data will be available in a customer dashboard providing easy to understand bandwidth performance and traffic statistics, available on board and for Marlink support experts to streamline remote troubleshooting. Looking forward, the demand for new satellite capacity and technologies to optimize it is not going to go away. The maritime industry is undergoing a transition as we speak, with digitalization offering the potential to transform the entire transport logistics value chain for the better. Satcom, especially VSAT, is a critical enabler of this. It can bring new ways of operating that will bring more sustainability to the industry as a whole — SATCOM can help the maritime industry to reduce its impact on the environment. With a global communications infrastructure for, i.e., reducing fuel consumption, the maritime industry can improve its green credentials significantly by focusing on advanced, new solutions, such as autonomous ships and smart ships — those would not be possible without SATCOM. This is an exciting time of transformation in the space industry, as new commercial markets open for satellites, communications, Earth Observation (EO), on orbit servicing, space exploration, space mining, space manufacturing and even space tourism. All of these developments are particularly encouraging for MDA Commercial, which has a deep heritage delivering iconic solutions into many of these markets, and is recognized as a world leader across a range of technologies on which the next generation of space business will be built. It is difficult to believe that the first Canadarm flight on Space Shuttle Columbia took place in 1981. As the creator of Canadarm, MDA was a pioneer in space robotics, successfully operating and maintaining the arm on 90 Space Shuttle missions. 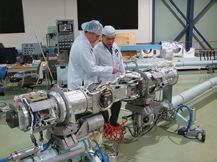 For more than a decade, MDA’s real-time Orbiter Space Vision System (OSVS) was used to conduct on orbit measurements critical in the support of International Space Station assembly operations and the company’s next-generation Mobile Servicing System (Canadarm2 and Dextre) has enabled the construction and maintenance of the ISS since 2001. Today, MDA’s Cygnus TriDAR rendezvous and docking sensor flies as a manifest item on Northrop Grumman cargo resupply missions, and MDA robotics and sensor solutions developed for the CSA, NASA, ESA and JAXA continue to enable human spaceflight and space exploration as they have for more than 20 years. At the same time, MDA has leveraged its Canadarm robotics and sensors heritage to derive new capabilities for unmanned, on orbit robotic satellite servicing for government and commercial customers, including some state-of-the-art flight demonstrations for NASA and the U.S. DoD and, in some cases, working together with our sister company, SSL, which is part of the Maxar family of companies. It is interesting to note that unlike almost all critical infrastructure on Earth that are regularly repaired and maintained, the bulk of the current “space” infrastructure consisting of hundreds of costly orbiting satellites are all “one-time” deployment and not serviced at all. These satellites are in need of maintenance support, some needing inspection and repair, some needing “gas up” to extend their life, while others will require assistance to “get out of the way” and to de-orbit once their useful life is complete. This has opened up a market for lowering overall lifecycle operating costs enabled by on-orbit robotic servicing. Allowing for only the satellites in orbit today, a 2018 market report has quantified on orbit servicing as a $3 billion market opportunity. As MDA has been sensing, grabbing and maintaining a number of highly valuable government space assets in orbit for nearly 40 years, the company is very well-positioned to serve the vast number of commercial satellite, as well; and MDA is already marketing and supplying new robotic and sensors kits for companies wanting to develop their own on orbit servicing operations. Today, MDA Commercial is revolutionizing on orbit satellite servicing and defining robotic and sensor solutions that will support the next generation of manned and unmanned space and planetary exploration missions, while redeploying those technologies to drive change in medicine, nuclear and aerospace industries with robotics automation here on Earth. For more than 50 years, MDA’s satellite payloads, antennas and electronics have enabled state-of-the-art communications and remote sensing solutions. Among the industry firsts achieved by MDA are the Anik satellites for Telesat, which were the first communications satellites for Canada, MSAT, short for Mobile Satellite, to support mobile communications, and the Synthetic Aperture Radar (SAR) antennas for RADARSAT-1 and -2 and the upcoming RADARSAT Constellation Mission for the Canadian Space Agency, which will further extend Canada’s capabilities in global remote sensing. The number of orders for new geostationary communication satellites has dropped substantially over the past three years, significantly impacting the satellite manufacturing industry. Globally, consumer behavior is shifting the demand from broadcast (linear TV) to broadband data (on-demand, internet-based entertainment), driving a new market emphasis on reducing the cost per bit through increased capacity and on-orbit payload flexibility. As a result, satellite operators are reticent to invest in traditional GEO satellites to maintain their fleet, a situation that is further exacerbated by the commercial market’s diversification to non-geostationary (NGSO) constellations that include lower-latency MEO and/or LEO satellites. As the world’s largest independent supplier of satellite payloads, antennas and electronics this downturn could certainly have had an impact on our growth, but MDA’s diversification strategies have mitigated the damage experienced by other dedicated GEO manufacturers. First, MDA successfully transitioned to a more balanced and wider customer base for its GEO solutions, as we are increasing our geographical footprint in emerging space countries and markets. Second, the company has been able to adapt and capture key sub-tier roles on institutional programs such as Sierra Nevada Corp.’s Dream Chaser communications system, the ISS communications subsystem refurbishment and the payload for the upcoming Airbus Defense and Space EDRS-D satellite. Third, MDA Commercial’s investments in Industry 4.0 capabilities led to its selection to play a key role on the O3b, INX and OneWeb constellations. An exciting time is ahead of us, as future years will be crucial for the LEO constellations business, with programs such as OneWeb and Telesat LEO reaching key investment and programmatic milestones. MDA will complete its integration within the Maxar Technologies family of companies in the coming year and realize the benefits of the new corporate structure through cost reduction, efficiencies and the ability to address bigger opportunities than it could as an independent entity. With 1,900 employees across Canada, MDA is the nation’s largest space prime contractor and continues to grow its ecosystem of innovative Canadian partners and suppliers. Additionally, the company is leveraging its core capabilities to explore new opportunities beyond space markets, into terrestrial markets that can benefit from its experience and technology. MDA expects those to materialize in 2019 or 2020, demonstrating once again the synergies between space, defense and other high-tech commercial markets. MDA’s involvement in the space exploration, space infrastructure servicing and space-based communication markets presents a dynamic mix of opportunities and risks. New and proven robotic capabilities are allowing critical government and commercial space assets to be assembled, maintained and upgraded. As well, the space-based communications market is undergoing a sea change in approach, technology and purchasing trends. Through leadership across multiple market areas, innovative engineering and the diversification of its customer base and targeted applications, MDA has achieved a very high level of competitiveness that enables continued growth and international success in the new space and terrestrial markets. Michael is responsible for strategy, global growth and operations of MDA’s commercial product lines, which include commercial space robotics, space sensors, vision systems, antennas, electronics, payloads and non-space products. His career spans 25 years in aerospace, critical communications and defense and security executive positions. He previously served as Senior Vice President at Inmarsat and Vice President of International Sales at General Dynamics Mission Systems. Mission Microwave completes 2018 with record revenues and an established industry position as manufacturer of RF products that raise the bar for innovation, performance and SWaP (Size, Weight and Power) in X-, Ku- and K-band BUCs. Although Mission is now recognized as a top-tier industry competitor, it actually started 2018 still perceived by many in the industry as a newcomer to the BUC business. Fortunately for Mission, word of mouth spreads quickly. Positive experience from system integrators and terminal manufactures gets around, and both integrators and manufactures are keen to be offer the best value and performance to their customers. By the end of 2018, that made Mission Microwave the obvious competitive choice for the leading integrators and manufacturers. The year for Mission Microwave was marked by the successes of their customers in the tactical, public safety, mobile and maritime market sectors. Customers in all of these segments have relied on Mission Microwave to provide BUCs that differentiate their system designs and improve the positioning of their products in terms of portability, ease of use and reliability at a commercially competitive price point. Mission has excelled at leading the industry in the delivery of Ka-band BUCs at power levels from 10 to 200 Watts. With hundreds of Ka-band units shipped in 2018, the company continues to provide customers with smaller, lighter, more versatile solid state BUCs for Ka Band. In the maritime sector, 2018 saw the approval and initial product announcements of new high performance maritime terminals based on Mission’s high power BUC for INMARSAT Global Xpress networks. The GX-XL BUC provides10 Watts of linear power to GX terminals for several major maritime terminal manufacturers. This significant power boost is delivered by Mission Microwave’s fully-integrated, 10W GaN amplifier, which significantly increases upload speeds, and facilitates a more reliable link to the GX satellites with enhanced throughput and greater reliability, the newly launched terminals raise the bar for those operating in an increasingly data-centric environment, while improving the overall experience of shipboard crew communications. On vehicular mounted antennas, Mission’s BUCs offer reliable and compact performance. The small size and weight is such that redundant systems up to 400 Watts, in a 1:1 configuration, can be mounted on the boom of a moderately sized drive-away antenna. Also on mobile communications vehicles; Mission’s 100 Watt Ku-band Javelin BUCs are deployed on emergency communications systems for a Nationwide Public Safety Network, operated by a major national American telecommunications carrier. During 2018, other applications that have earned the loyalty of new customers in the wide ranging mobility markets include SOTM (Satellite-On-The-Move) terminals on a variety of platforms, including maritime, unmanned, and ground mobile platforms integrated on flat panel or traditional parabolic antenna structures. Many of the Mission Microwave products are so highly integrated into their customers’ designs that they are not visible — despite the signature “cylindrical” shape of these BUCs. At a trade event earlier this year, Mission debuted products with a more traditional rectangular shape for both low power and high power applications. The Flatpack and Cube BUCs are designed for highly integrated terminals – at 1.75 lbs, the Flatpack offers 12 Watts at Ka-band or 25 Watts at Ku-band in under 35 cubic inches. The Ku-band Cube is the ideal bolt-on 25 Watt BUC weighing in at only 2.5 lbs. The high power MOAB Ku-band BUC brings 400 Watts of RF power in a 35 pound package; 33 percent lighter than products marketed as “the industry’s lightest.” The MOAB is also the most efficient BUC in its class, making it ideal for maritime applications within a radome or in other high reliability, high temperature environments. Efficiency is the hallmark of Mission’s products. Mission BUCs prime power to RF energy efficiency is higher than any other BUC in the industry. 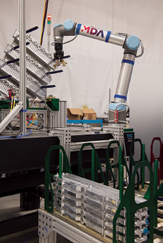 Mission’s customers understand that higher efficiency leads to higher reliability. Less efficient BUCs generate more waste heat and heat is the primary enemy of reliability for high power RF power products. Mission has had several patents granted in 2018 and continues to expand its IP portfolio in regard to highly efficient RF designs. Mission Microwave’s BUCs in X-, Ku- and Ka-bands range in output power from 10 to 400 Watts. These BUCs have been incorporated in the leading on-the-move, tactical, and flyaway terminal in the industry. High-end users of SATCOM terminals insist on using Mission Microwave BUCs for performance and SWAP benefits. Mission’s customers have requested several features in 2018, including some DC power variants of high power units and the incorporation of reference oscillators in some units. Looking into 2019, Mission expects to bring additional compact products, as well as higher power products, to the market in X-, Ku- and Ka-bands and to expand the frequency range for more versatile Ka-band products. Several terminal manufacturers have announced their intent to develop flexible Ka-band terminals and Mission intends to offer products that can work on multiple satellite network architectures throughout the commercial Ka Band. Thanks to an impressive list of top-tier customers, the industry has recognized Mission Microwave as a reliable, credible and preferred provider of X-, Ku- and Ka-band BUCs. Mission’s customers expect Mission to maintain its market position through continued innovation, allowing them to provide the most competitive products. Mission leads the Satcom BUC industry in RF efficiency (the conversion of prime power to RF power) and offers products that are 30 percent more efficient than competing products. Mission’s team has expanded significantly in 2018 and the company will continue to evolve its organization in support of its growing customer base. Throughout 2019, Mission will continue to invest in development of new technologies and lead the Satcom industry in the development and application of GaN devices for satellite communications. 2019 will be another banner year for this innovative leader in high power SATCOM BUCs. Both Mission Microwave and its customers are planning on more success and bringing new capabilities to end-users, as the satellite industry evolves beyond traditional architecture to mobile and non-GEO networks in 2020 and beyond. Mr. Steve Richeson joined Mission Microwave in 2017 and is responsible for the company’s sales and marketing organization. He has 30 years of satellite and Radio Frequency (RF) experience in engineering and sales leadership roles at Advantech Wireless, Exelis Inc., Harris Corporation, EchoStar, Scientific-Atlanta, GTE Spacenet International, RSi SATCOM Technologies and Schlumberger. Mr. Richeson was the founding CEO of RF Solutions, Inc. a compound semiconductor design firm started by Georgia Tech faculty where he raised two rounds of venture investment. He is a Senior Member of the IEEE and a Registered Professional Engineer and earned his electrical engineering degree at Georgia Tech and an MBA at Georgia State University.